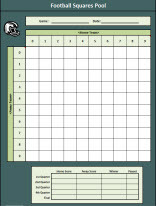 Our FREE Football Squares Pool Template can be used for your next office pool. This template works great for the Superbowl! Enter the Home and Away teams into the template, as well as randomly drawn numbers from 0 to 9. Determine payouts and then print the template as a sign-up sheet. Players enter their name into squares based on their guess at the last digit in the score for each quarter.